With the development in the sixties of computer-based analysis methods, the teaching of structural analysis subjects was revolutionized. The traditional division between structural analysis and structural mechanics became no longer necessary, and instead of teaching a preponderance of solution details it is nowpossible to focus on the underlying theory. What has been done here is to integrate analysis and mechanics in a systematic presentation which includes the mechanics of a member, the matrix formulation of the equations for a system of members, and solution techniques. The three fundamental steps in formulating a problem in solid mechanics enforcing equilibrium, relating deformations and displacements, and relating forces and deformations form the basis of the development, and the central theme is to establish the equations for each step and then discuss how the complete set of equations is solved. In this way, a reader obtains a more unified view of a problen1, sees more clearly where the various simplifying assumptions are introduced, and is better prepared to extend the theory. 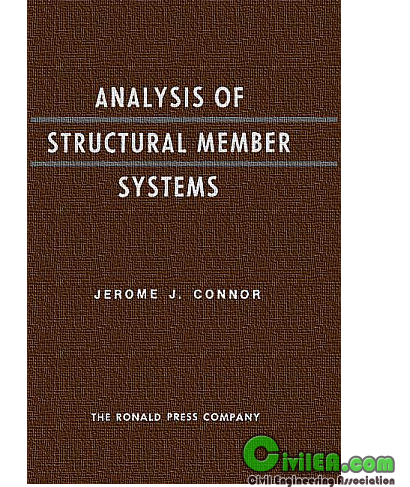 The objective has been a text suitable for the teaching of modern structural member system analysis, and what is offered is an outgrowth of lecture notes developed in recent years at the Massachusetts Institute of Technology. 1.Read and Follow the Forum RULES Strictly & Carefully. 2.Always Search Before Posting new materials or Requests.